Go-Karting at Glasfryn Parc Go-kartingThe 600 metre length and 8 metre width floodlit track is divided into a junior and senior circuit and has proved to be a great hit with karting enthusiasts and novices alike. 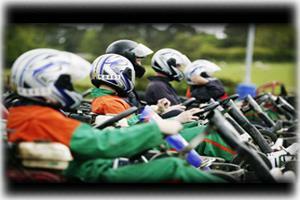 The purpose built go-karting track is suitable for competitions, racing or training. Grand Prix and Endurance Races with computer timings and trophies can be arranged….and with our floodlighting we can now offer evening racing. Our computerised timing system means you can race against the clock....or against each other. The 600 metre length and 8 metre width floodlit track is divided into a junior and senior circuit and has proved to be a great hit with karting enthusiasts and novices alike. Open all year 7 days a week from 10am. Call for bowling and evening bookings. Karts - arrive and drive. Glasfryn Parc is conveniently situated 4 miles east of Pwllheli and 15 miles from Caernarfon on the A499 Caernarfon Road...just look out for the flags. We are approximately a 2 hour drive away from Liverpool and Chester and 40 minutes from Bangor.